After 40 years of thwarted attempts, the North Ridge of Latok I (7145m) has been climbed by a variation that finished on the south side of the mountain by Slovenian climbers Ales Cesen and Luka Strazar, and British climber Tom Livingstone. Amazing news from Karakoram! After dozens of attempts since 1978, the "impossible" Latok I (7145m) was finally climbed from north by our Luka Strazar together with Ales Cesen and Tom Livingstone! We congratulate Luka and mates for this huge, astonishing achievement about which we still have little information. Alpinists will come back in Slovenia the next week: stay tuned for details and images! UKClimbing.com reports that the trio returned to base camp on August 11. Livingstone has been having a successful year in the mountains. In April, he and Uisdean Hawthorn completed a new route they called Fun or Fear (AI 6 R M6+, 90 degrees, ca. 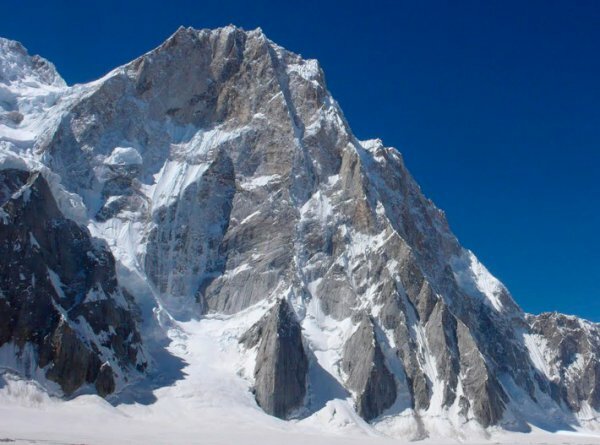 1200m) on the east face of Jezebel in Alaska; and in January Livingstone teamed up with the late Marc-Andre Leclerc in Canada for the first winter ascent of Mt. Slesse's Navigator Wall (M7+ R). Latok's North Ridge has had a mythic appeal since the American team of Jim Donini, Michael Kennedy, George Lowe and Jeff Lowe nearly succeeded on the long, committing ridge in 1978. They came within a few hundred meters of the summit, but they retreated after Jeff Lowe nearly died from a sudden onset of altitude sickness. Until this last month, no one has surpassed their high point, despite many attempts by elite alpinists over the years. In the aftermath of his dramatic helicopter rescue from 6200 meters on the North Ridge of Latok I (7145m) on July 31, Alexander Gukov recently told Mountain.RU Editor Anna Piunova that he and Sergey Glazunov had reached a new all-time high point, which included summiting a tower that caps the North Ridge. "Weather and seracs stopped them from continuing," Piunova told Alpinist of Gukov's recent attempt. During the retreat in storms, Glazunov fell to his death. Last year, Gukov reached the highest point since the 1978 expedition—about 6700 meters according to his report in the American Alpine Journal. "It took us four days to rappel the ridge from our high point," Kennedy recently told Alpinist of their 1978 attempt. "There was rockfall coming down all the time on either side of the ridge, so we planned to descend the way we came up (instead of going up and over the summit to get off)—we had a fair amount of hardware with us and cached some of it on the way up, and used flagging tape to mark caches and any anchors we left in place." The 1978 team also cached food, which they entirely devoured in about 10 minutes when they reached it on their way down—"we were starving," Kennedy said. "It is a super serious place." Thomas Huber recently arrived in the area with Simon Gietl, Rainer Treppte and Yannick Boissenot to attempt a line on the north face or the North Ridge, depending on conditions. Huber is quoted in an Adventure Sports blog with Stefan Nestler saying that he believes the ideal season for climbing Latok has changed from mid-summer to end-of-summer because of global warming. Kennedy told Alpinist that the conditions on the mountain during their attempt on the North Ridge 40 years ago were probably much different from what most climbers have encountered since then. "When we were there it was dry and hot, probably drier than many of the subsequent years," he said. "The cornices weren't as bad, and we had decent snow and neve."